Shadowrun: Dragonfall Director's Cut is the GWJ CRPG's Club's first winner! We'll be playing this game until June 30, 2018. This thread is for friendly discussion as we play through the game. Share your reflections, successes, defeats, tactics, wishes, impressions, and whatever here! The more conversation the better, so post away. It's worth mentioning that if you are up for a bigger challenge, a few brave souls are attempting to play all three Shadowrun games during this playthrough. If Dragonfall isn't enough for you, feel free to add Shadowrun Returns and/or Shadowrun Hong Kong. I’m going Decker and also putting points into drones. Figure they both feed off of intelligence and can make up for my otherwise weak offense. I'm in, chummers. Say hoi to Punch, the street sam. I started Dragonfall originally with a decker, but found the decking really underwhelming—just shooting in cyberspace. So I re-started as a bog standard street sam. Now I'm finding a lot of truth to the old adage, "If all you have is a Smartlinked assault rifle, everything looks like a target." I had a lot of greyed out dialogue choices when dealing with Frank at the club, and all I could choose was "[Attack]". So maybe I'll put a little karma into decking or something for some options. I used to play 2nd edition, it was the only other RPG my group played significantly besides AD&D. We'd take any job if it got us closer to some delta-grade cyberware (our GM never gave us any delta-grade cyberware). 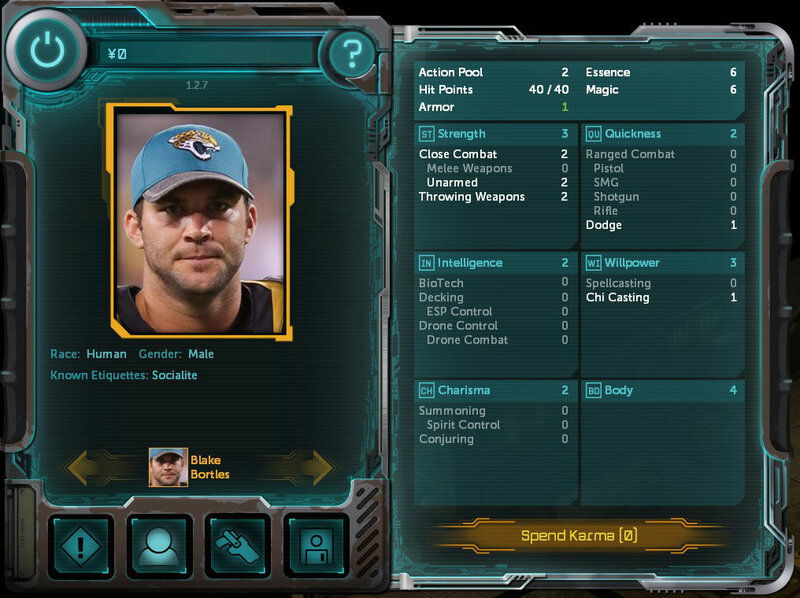 I fired up Shadowrun Returns and created my character... Blake Bortles. My first playthrough of this game, I was all about decking and precision combat, but ol' Blake here is going to do things more rough and direct. He's specializing in unarmed combat as well as throwing weapons - grenades. As a physical adept, he is able to channel his "Garbage Time" magic to enhance his own abilities. He's a popular guy that gets invited to all the fancy parties. He's not really clever enough to come up with a street name, and always seems to refer to himself with his full name. Whew, some of those Troll avatars are rough on the eyes. I'm in, but I'm gonna be a couple of days behind you all. I started Returns a couple of times and was underwhelmed, only managed a few hours each time. I've heard this is much better though so I'll give it a shot! If I remember rightly I got it for free from my brother, who had kick-started at a level that got him two keys, so I can't really lose. I just finished Das Kesselhaus and picked up a decker for my party. Now I have a bunch of karma to spend—should I put any points into decking for my character? I don't intend to do any decking, but just for conversation purposes. Or is that unnecessary since I have a decker? If there's any hacking to do, can he do it? I've encountered a lot of dialog based decking skill checks. Having 4 points in decking opens a lot of doors...literally. Might be worth considering if you've the spare karma. Having 4 points in decking opens a lot of doors...literally. Might be worth considering. ah, I'd forgotten just how GOOD the writing is in this game! This is going even better than I hoped. ... and I can't even use it in game! wait, why can't you use it? the way it's formatted? *try this. Should overwrite pc_dwarfmale_00b.png in the folder. Thanks. It's because I'm trying to play it on tablet first, if it runs ok then I'll get more time with it. If it's shocking I'll head back to Mac, I'll use it if it comes to that, which it might well do. 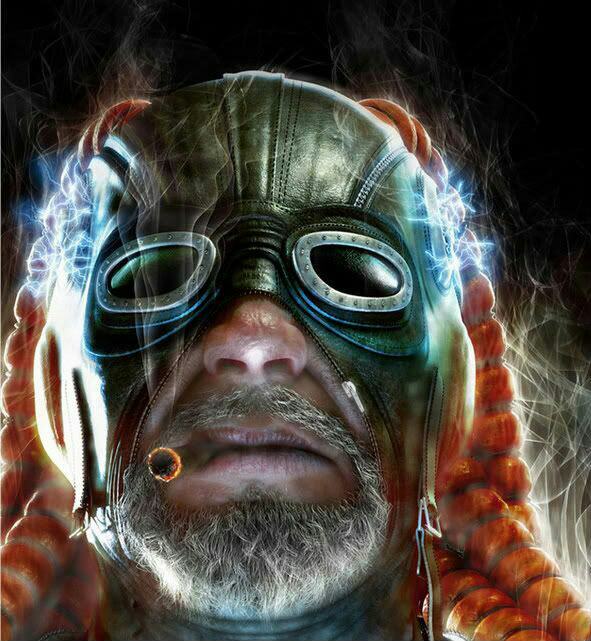 To be clear, I knew I wouldn't be able to use the pic in game, just for fun character hunting. It was a friendly damning, for inspiring to go down that rabbit hole. After 20 mins actual gameplay on tablet, looks I'll be picking it up off the Mac pile after all. Too small, graphically not great, dark, long loads and too easy to miss tap on Android. I also did not realize that characters had all the secondary skills so I was really beaten up when the second half of the starting mission starts. I've retried it there a couple of times but I think I'll just start the mission over! I'm also playing a decker just because it fits the story it seems. I really did not realize how often NPCs say your character's name until they all started awkwardly saying "Blake Bortles" every screen. Welcome all! I think I've everyone playing listed in the first post, but if I missed anyone, let me know. I saw a skill improvement that allowed Overwatch, maybe that's the opportunity fire? I'm intentionally not reading up on everything I see, avoiding rabbit holes. Ah, that might be it, then. Thanks! Yeah, I'm not familiar with the D&D rules, and it was quite a while before I noticed the toggle switch for the right side menu that opens up different types of action options for some characters. Dietrich in particular had some powerful options on the right side. Even with those, though, I had to play defensively to make that mission work. I burned through a lot of those medic kits. I'm looking forward to playing more today, once I get some coursework done. Haha. This is awesome. I'm tempted to counter with Case Keenum, depending on today's results. yes, sorry meant to confirm - there's an overwatch ability that unlocks when you skill up with weapons to a certain level. I'm in. Played the first two missons so far. 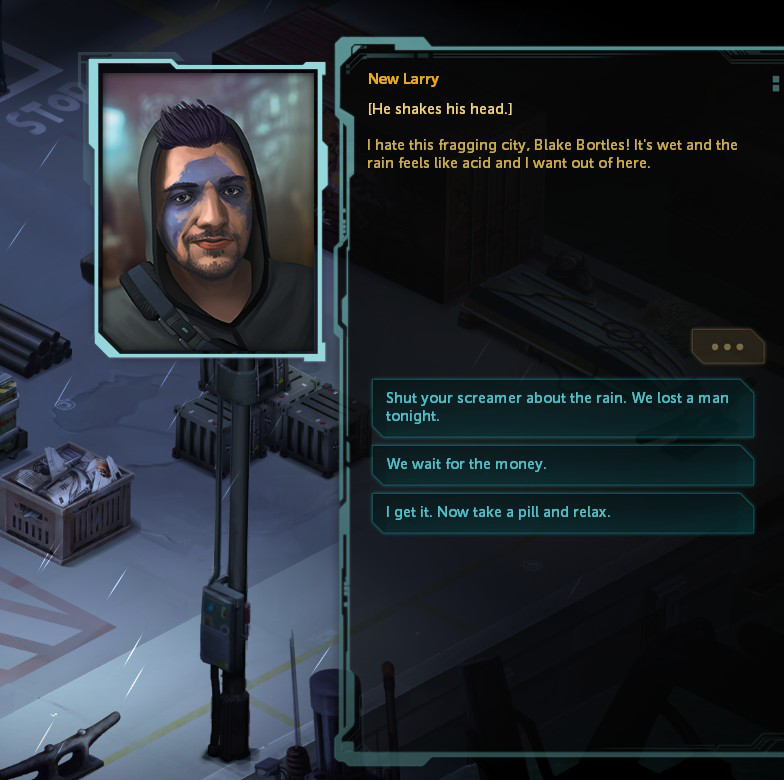 This seems a lot better than I remember Shadowrun Returns being. I'm also in. Haven't rolled my character yet, but I'll be playing. I agree! I have to admit, I wasn't thinking that our first game would be a Cyberpunk RPG, but I'm glad that it's worked out this way now. I've enjoyed what I've seen so far. Nice, thanks much! That's a clever way to work that into a game. Most excellent, I've added you! There is plenty of time, of course. Played through the first few hours on iOS a few years ago but fell off the wagon. Wanting to come back to this at some point has been the main thing keeping me from updating my iPad to iOS 11 (the developers have said that they won' be updating Dragonfall to 64-bit as far as I know, so updating will break it) but I expect that will get more untenable as time progresses. I was rolling an elf shaman on my original run, but consensus here seems to be that a Decker opens up the most story beats so I'm rolling one of them this time round. Just finished the intro mission and am kicking myself for putting this off for so long--the worldbuilding is top-notch. Oh my gosh I failed the first mission on easy. Small Correction Godzilla: there's only one upgrade needed for overwatch, on firearms itself. not on individual weapons. My mistake! 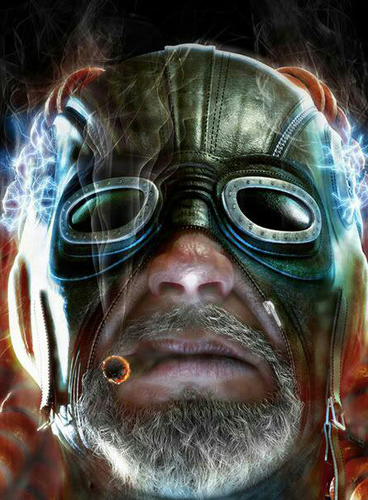 Did you try using the elemental summon to distract the power-armoured ork? I'm pretty sure it's placed there specifically for that purpose as a distraction. Yeah, that’s what I did. The orc never bothered anyone but my summon. Jumped into this after finishing up the first game. The interface updates are welcome and, through the first mission / introduction, I can already sense a improvement in the writing. Elemental summon? What elemental summon? I guess I'll have to take another crack at it tomorrow! I lurked into this thread and fired up the game. Very fun. Decker as well. Glad I read this.